The Expedition 52-53 trio will return to Earth Dec. 14. 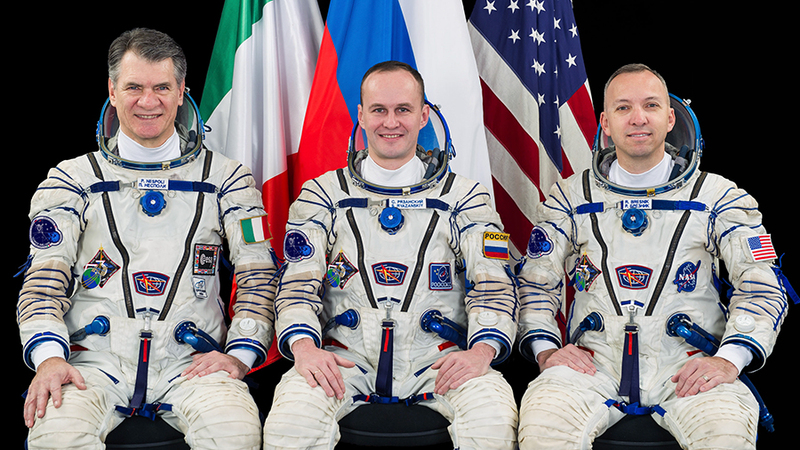 The crew members (from left) are European Space Agency astronaut Paolo Nespoli, Roscosmos cosmonaut Sergey Ryazanskiy and NASA astronaut Randy Bresnik. The International Space Station is orbiting slightly higher today to get ready for a pair of crews swapping places on the orbital laboratory in December. A Progress 67 resupply ship docked to the rear of the station fired its engines for just over three minutes this morning boosting the orbital lab to its correct altitude for next month’s crew departure and arrival. Three Expedition 53 crew members from the United States, Russia and Italy are getting ready to return home just in time for the holidays. Commander Randy Bresnik and his cohorts Sergey Ryazanskiy from Roscosmos and Paolo Nespoli from the European Space Agency are due to land Dec. 14 inside their Soyuz MS-05 spacecraft in Kazakhstan. From there, the veteran space trio will split up and return to their home space agencies about 24 hours later having just spent 139 days in space together. Next up are three Expedition 54-55 crew members who will launch Dec. 17 for a two-day ride to the station inside the Soyuz MS-07 spacecraft. Veteran cosmonaut Anton Shkaplerov from Roscosmos will be conducting his third tour aboard the orbital complex. Scott Tingle from NASA and Norishige Kanai from the Japan Aerospace Exploration Agency will both be starting their first missions in space. All three will spend four months orbiting Earth. Greeting the new crew when it arrives on Dec. 19 will be Expedition 54 Commander Alexander Misurkin of Roscosmos and NASA Flight Engineers Joe Acaba and Mark Vande Hei who have been in space since Sept. 12. Misurkin will open the Rassvet module’s hatch where the Soyuz spacecraft will be docked and welcome the new crew members when they come flying in the station. Clear in the east upstate ny been great for observing last week. Just went over southwest to no northeast. Antes del impacto del huracán Maria y después del paso siempre me entretiene más ver los trabajos de ISS más que la información de la TV local. El trabajo es fuerte y la contribución es enorme. Felicitaciones a expedition53.